Last year, Firefox 3 added the option to associate protocols with web applications. A common way to link to mail addresses is using the mailto: protocol, so you'll often find links like security@google.com. * For Firefox 4+, click the Firefox drop-down menu and select Options > Options. For Firefox 3.0-3.6, go to Tools > Options. * click OK to save the settings. If you want to set Gmail as the default mail client for your computer and not just for Firefox, install Google Talk, Gmail Notifier for Windows or Google Notifier for Mac. When will Chrome (chromium) be able to do that? Hmm... Doesn't work for me, I wonder why? In most Linux distros the path in Firefox to this option is "Edit/Preferences/Applications". 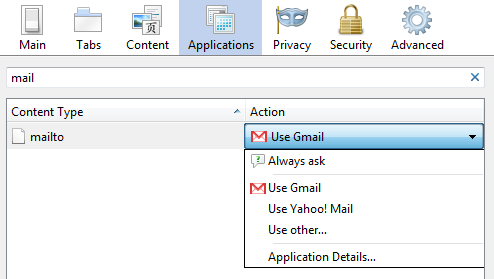 How I can use Google Apps mail as default? Ignore my previous comment, I went into about:config, found that network.protocol-handler.external.mailto was set to false, and toggled it. Toggled a few other values also, but I think the aforementioned was the important one. For Google Apps, check this post from Gmail's blog. Remember to edit the domain name. If you have Google Toolbar installed and the option "Use Gmail for Mailto: links" is checked, the Firefox preferences are not taken into account. You may also want to check-out Affixa (http://www.affixa.com/), which becomes your machines default mailto: handler, supporting multiple GMail, Google Apps, and Yahoo accounts, as well as drag-and-drop attachments. I don't have the gmail handler in Firefox 3.0.11 on Ubuntu 9.04..
Weird - works on one machine, but doesn't work on the other. I'm using FF 3.0.11 on all PCs. Cool feature though. Same as the last Anonymous... it's not there for me.. I use Kubuntu 9.10. Those Google Apps instructions seem unrelated to this option in Firefox you're talking about. Easiest thing for Google Apps users is to use Greasemonkey and install the "Mailto - Google GMail (Clean, Fast, Popup)" script which works perfectly with Google Apps. 1) Go to Google Apps and sign in. 2) While in Google Apps, copy and paste the following into your browser's address bar and hit enter. A message will dropdown prompting you to add the application. I've never seen deliver the URL for Google Notifier for Mac something else than a 404. Same this time when I tried in eager. It is working. I have also done. Thanks for sharing this information !! buy_acai - Enough of the spam. Your name alone made me not want to go to the link. Not to mention it only works in Windows. Thanks for this informative post.I am using Firefox for quite few months but was unaware of this thing....Thanks again and please keep on sharing useful stuff. This is great. I want to see the the new message dialogue open in a tiny new window, instead of new or current tab. Is this possible? People with other browsers - lrn2greasemonkey. Oh, okay, I never knew about this feature, although I do seem to remember it doing this automatically without me having to set anything. I am new in internet. I got g mail conection 3 days back. When I entered the User Id, Without entering the Passward, the passward is automatically entered (stayed) Please help me anybody what shoud I do for that? That's a browser setting. Assuming that you use Internet Explorer, check this guide. For other browsers, use Google to search for [disable password autocomplete]. by installing fire fox and naming gmail as primary email client, will this make gmail primary email when using MS Publishers as email client in lieu of MS Outlook? No, you'll only change the email service that handles mailto: links that open in Firefox. For a system-wide change, install Google Talk's desktop client (not the video chat plug-in) or Gmail Notifier. Anyone any idea how to make the ?Subject+ parameter work, such as you get in the HTML digest form of Yahoo groups? Bless you! this has been driving me nuts. So simple when you know how! i need a step-by-step here. i cannot find tools and when i copy and paste there is no drop box for an addition of the application. HELP!!! Hey i feeling very glad to see this type of information as well as shortcut. I like to keep my browser very smooth and definitely it works very perfect.